In these dynamic programs hosted by radio talk show personality, Donna Voll, Master Sha presents the essence of his recent New York Times bestselling book, The Power of Soul: The Way to Nourish, Bless and Enlighten All Life. 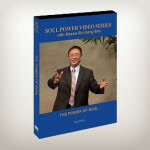 East meets West in the Soul Power Video Series with Dr. and Master Zhi Gang Sha. In these dynamic programs hosted by radio talk show personality, Donna Voll, Master Sha presents the essence of his recent New York Times bestselling book, The Power of Soul: The Way to Nourish, Bless and Enlighten All Life.